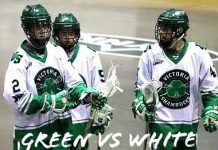 Victoria, BC – With 8 days until the Season Opener on May 19th, the Victoria Shamrocks are pleased to announce the signings of defensemen Sheldon Burns and forward Mike Triolo. Sheldon Burns is coming off his third National Lacrosse League season with the New England Black Wolves tallying 9 goals and 19 points in 18 games. The 25 year old hoisted the 2011 Minto Cup as a member of the Whitby Warriors Junior A, and was an honourable mention for the IL Indoor Defender of the year. The 6’2” defender has spent the last 3 seasons with the Brooklin Redmen in the Major Series Lacrosse League. “Heading to the west coast to play has always been something I’ve wanted to do. To have the opportunity to come and play for such a historic organization is truly humbling. I look forward to suiting up and battling for a Mann cup this summer” said Burns. Mike Triolo, who turns 26 during the season, comes to Victoria fresh off winning the inaugural Arena Lacrosse League Cup with the Oshawa Outlaws. He was named by media as the Most Valuable Player in the Canadian lacrosse league. The big 6’8”, 245 lb forward recorded 69 points in 14 games, good for second in the league, then scored another six in two playoff games. “I’m more than excited to be here with the Shamrocks. Especially when every year with them is a Mann Cup run. I’m glad I get to be part of such a great organization and I’m looking forward to the season” said Triolo. 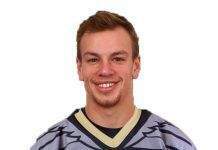 A four year Major Series Lacrosse veteran, Triolo played his first three seasons for the Brooklin Redmen, and was teammates with Burns all three seasons, and during his 2016 campaign with the Cobourg Kodiaks. “Both of these guys have a lot of upside and I have no doubt they’re going to fit in great and make big contributions. They check a lot of boxes on our off-season shopping list as we strive to get deeper, bigger and faster so we’re excited to add them to the mix” said Shamrocks general manager Chris Welch.